ATLANTA (AP) Dennis Schroder was excited about the consecutive wins for the Atlanta Hawks. He was more pleased that his team beat an opponent that has more talent, at least on paper. 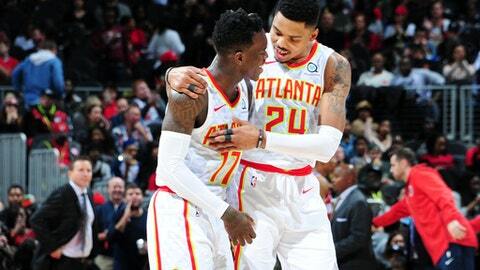 Schroder scored 21 points, Ersan Ilyasova added 20 and the Hawks won consecutive games for the first time this season with a 113-99 victory Wednesday night over the mercurial Washington Wizards. The Wizards were coming off their best win of the season, a high-energy 111-103 victory at Boston on Monday, but they have been unable to shake a reputation for playing down to the competition. Marco Belinelli scored 19 points in 20 minutes for Atlanta, the NBA’s worst team at 9-25. Bradley Beal had 20 points for Washington (19-16), which was trying for its first three-game win streak since mid-November. Markieff Morris had 18 points and eight rebounds, and John Wall finished with 10 points and 11 assists. Already saddled with home losses last month to Phoenix and Dallas, the Wizards were beaten twice this month at Brooklyn, the latest a 35-point setback last week. Losing to Atlanta dropped Washington to 9-10 against teams under. 500. The Wizards fell behind for the first time when Belinelli hit three free throws at the 4:54 mark of the third. The lead changed hands a couple of times before John Collins’ tip-in at the period buzzer put the Hawks up for good at 78-76. Washington coach Scott Brooks went with a three-guard lineup midway through the fourth with Wall, Beal and Jodie Meeks joined by Otto Porter Jr. at forward and Morris at center. It didn’t work. Down by nine, the Wizards pulled within four on Beal’s 14-footer and Morris’ dunk with 6:17 remaining, but they lost focus as Schroder hit a layup and immediately stole Wall’s inbound pass to set up Ilyasova’s two free throws. Ilyasova followed with a 3, Schroder hit two free throws and Miles Plumlee had a tip-in to make it 101-90. The Hawks’ biggest lead was 18 in the fourth. Wizards: The worst part for Brooks was watching the Hawks outhustle his team. Despite a bigger, deeper lineup, Washington was outrebounded 53-40. ”We couldn’t get any stops, we were taking bad shots and then we gave them hope,” he said. ”Once that happened, we couldn’t turn it off. They were making shots and playing at a higher speed than us. We’ve got to figure it out.”… Washington missed a chance to have 10 road wins and 10 home wins before Jan. 1 for the first time since 1978-79. Hawks: Were coming off a 112-107 victory over Dallas, the worst team in the West. … C Dewayne Dedmon has been cleared to resume basketball activities after missing the last 14 games with a stress reaction in his left tibia. Coach Mike Budenholzer said a CT scan showed the bone is healing on schedule, though Dedmon might need another 10 to 14 days before he is ready to play. Wizards: Host Houston on Friday and Chicago on Sunday. Hawks: Visit Toronto on Friday and host Portland on Saturday.